I have been on the lookout for a male GTP to pair up with my female Aru. 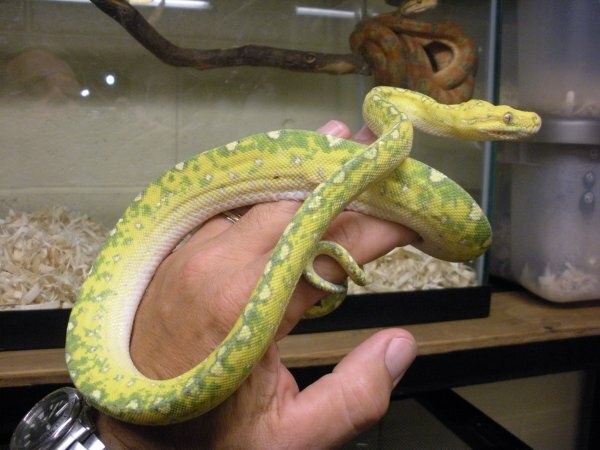 Its not that there is any challenge to finding a male GTP, I was just waiting for the one that would make me say Wow! At this past show in White Plains I may have found him, or not. I found this male which is a little larger than my Aru was when I got her. She was completely green when I got her and I reasoned that this may be a male that will retain a lot of its yellow into adulthood. I really rolled the dice on this one. 3 bills shelled out and not knowing what the dame or sire looked like or having any background info whatsoever on this one. What I knew or it was what I had in my hand, he's very yellow, solid and active. Yes I rolled the dice hoping for a 10 the hard way. Ok 2 weeks in and he's finally settled in and feeding. Bad news is he has mites. Oh well I've dealt with worse and this is an easy fix. Hopefully now the worst that will happen next is he will complete the color change and be an typical GTP. I would like to hear your opinion on whether there is any merit in my reasoning in comparing his size to that which my Aru was when her color change was complete and will he retain the yellow into adulthood?